Video: Why more farm microbes and less sterility are needed for great-tasting cheese. Bronwen Percival, Cheese Buyer, Neal's Yard Dairy. Video by The New York Times Conferences. 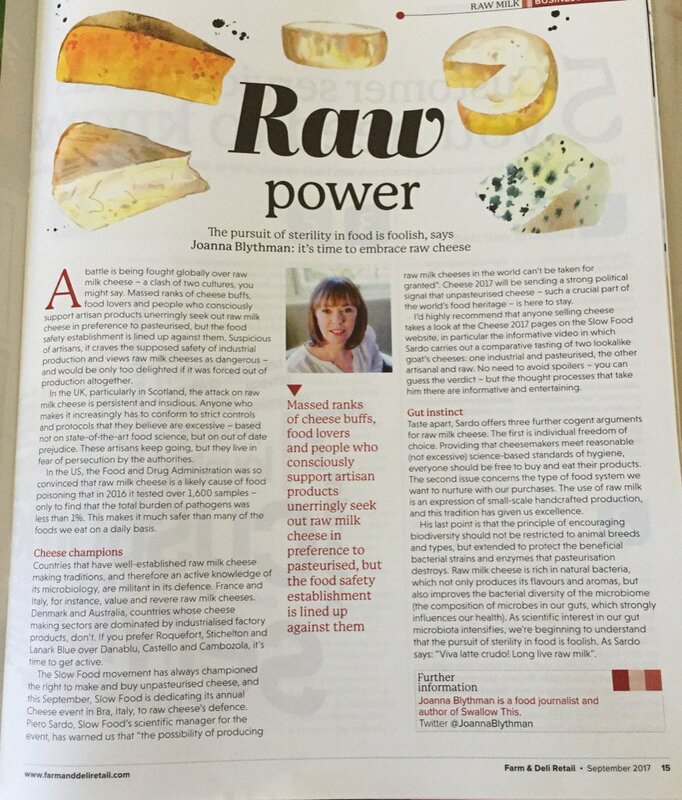 Recently Bronwen Percival made a great case for the return to utilising natural microbes for increased safety of raw milk cheese. This was at the New York Times Food for Tomorrow conference which brought together top chefs, policy makers, innovators and leaders from diverse fields to uncover and assess the most important issues and trends affecting the nourishment of the USA and the world. Raw milk cheeses are already widely produced in New York state. Surrounding states like Vermont and Pennsylvania also have very successful and established raw milk cheese industries. The video below illustrate their success. Video: Brothers Andy and Mateo Kehler live in Greensboro, Vermont. Together they produce raw milk cheeses at Jasper Hill Farm. Video by Food Forward TV. More cheesemakers desire to return to traditional cheesemaking with the use of the natural lactic acid bacteria uniquely found in clean, unprocessed milk from grass-fed animals. This is already happening in many parts of the world where there is a well developed and valued food culture. This article makes a case for the safety uniquely found in raw cheese produced with traditional wisdom. Why? Food safety is very important to Australians. Australia is seriously behind in world best practise when it comes to producing traditional method, non industrial raw milk cheese. The production and sale of raw milk cheese in Australia was legalised early 2015, but still we have only 4 dairies producing these artisan cheeses. Three of the four dairies are in South Australia. These cheeses are seriously expensive to make and buy locally. They also have to compete with much cheaper imports from Europe. The production of many of these European raw cheeses are not nearly as rigorous as our own, yet they are considered good enough for Australians to eat. This begs the question: why over-regulate Australian raw cheese production? Many dairy farmers have told ARMM that this market is closed to them due to crippling high costs, non-profitability and other impossible hurdles. New Zealand cheesemakers echo these sentiments. Read more about how regulations are used in a non-constructive way in this article: Fair Regulations and Production Standards for Raw Milk. Photo: Biddy Fraser-Davies via Romany Rambler. Audio: Listen to Biddy Fraser-Davies from New Zealand's Cwmglyn Farmhouse Cheese talk about her fight with government over unrealistic food safety fees. She says her business is facing death by compliance costs. Also interviewed is Jeanne van Kuyk of Aroha Organic Goat Cheese and Annie Armstrong from Whangaripo (source). "Microbe limits for New Zealand cheesemakers as set out in the Australia New Zealand Food Standards Code are currently 100 times more stringent than for imported raw milk cheese... It's already been eight years since the law changed to accommodate raw milk cheesemaking and importation. That's a long road to a level playing field for the locals, who would like to see our tolerance for microbe limits come into line with those accepted by the regulators of the EU (source)." Small scale cheesemakers seek sensible, scale appropriate regulation, realistic compliance costs and a level playing field. They recognise that all these rules, compliance costs and procedures are prohibitive to a thriving artisan cheese industry. Many do NOT welcome 'bacteriological correctness'. Regulations in New Zealand and Australia are frustrating and burdening producers. Raw cheese producer Biddy Fraser-Davies say: "they [MPI] are still getting very up-tight about the microbe levels." "Escherichia coli (E. coli) bacteria normally live in the intestines of people and animals. Most E. coli are harmless and actually are an important part of a healthy human intestinal tract." "Most E. coli bacteria are harmless or even beneficial to the human intestinal tract, but generic E. coli has traditionally been used as a microbiological indicator of the lack of adequate sanitation during processing." Read more here. Cheesemakers do not want to hear about 'bacteriological correctness' anymore. Authorities should test only for pathogens, not harmless bacteria. According to a September 2017 article by journalist Joanna Blythman, the US FDA was so convinced that raw milk cheese is a likely cause of food poisoning that in 2016 it tested over 1,600 samples - only to find that the total burden of pathogens was less than 1%. She says this makes it safer than many of the foods we eat on a daily basis. In the same article she mentions the work of the Slow Food Movement, in particular Piero Sardo who argues that cheesemakers should meet reasonable (not excessive) science-based standards of hygiene enabling everyone to be free to buy and eat their products. If you make a study of the successful raw milk cheese industries of Vermont, New York and Pennsylvania, you come to the conclusion that Australian and New Zealand cheesemaking systems needs a serious rethink and overhaul. It is over-regulated. The two videos below demonstrate the value of alternatives to industrial milk. It proves what we already know: it is a sound investment for the future and there is huge demand. Video: American dairy is undergoing a renaissance. A cottage industry of dairy farmers, cheesemakers and creameries are creating delicious alternatives to industrial milk. In this episode of Food Forward, we meet Vermont cheese entrepreneurs making serious cheddar. This scene features Jasper Hill Farms in Vermont. is the cheese buyer for Neal's Yard Dairy, a London-based retailer, wholesaler and exporter widely credited with the revival of British cheeses. In 2012, Bronwen instigated a biennial conference on the science of artisan cheese, bringing together scientists, cheesemakers and public health officials from three continents. In 2014, she spent two months in the Dutton Lab at Harvard University studying the microbial communities on cheese rinds. With microbiologist Dr. Benjamin Wolfe, she founded MicrobialFoods.org, a website dedicated to making cutting-edge science on artisan fermented foods available to the general public. Bronwyn writes in this article that a consortium of French scientists published a practical guide to raw milk microbiology aimed at farmhouse cheesemakers interested in fostering the natural microbial diversity of their milk. They show that healthy and stable microbial communities contribute to cheese safety (as evidenced by some of the research into the microbial biofilms on wooden boards used for ageing Reblochon), and are also crucial to cheese flavour. Image: Purchase on Amazon here, click for larger view. In 2015 Bronwyn helped to fundraise for the translation of this groundbreaking French guide. This recipe for creating safer raw milk cheese is now available in english. To reiterate: we need less sterility and more natural microbes for safer raw milk cheese. Australia and New Zealand can benefit from the wisdom of the French. Now we need regulatory change to enable small scale dairy farmers in Australia to exit the Milk Crisis and enter into producing raw milk cheeses that are profitable and regulated fairly. Audio: BBC Radio's Dan Saladino finds out what the future holds for cheese, including the role of raw milk. It's a story of microbes, mystery, discord and symphony. Image: Purchase his book on Amazon here. need no introduction to Australian raw milk supporters who flooded to see him when he came to teach his unique cheesemaking skills in Melbourne, Sydney and Tasmania earlier this year. He has expressed an intention of returning next year. Producing raw cheese and selling it is prohibited in his home country Canada. David regularly offer his raw cheese to family and friends and teach others to make it themselves. Raw milk supporters have written on ARMM's Facebook page that they make their own raw milk cheeses with the natural bounty in the milk. Not under sterile conditions and not with laboratory cultured cultures. They love David's natural methods. In The Art of Natural Cheesemaking, David Asher practices and preaches a traditional, but increasingly countercultural, way of making cheese―one that is natural and intuitive, grounded in ecological principles and biological science. It is the first cheesemaking book to take a political stance against Big Dairy and to criticise both standard industrial and artisanal cheesemaking practices. It promotes the use of ethical animal rennet and protests the use of laboratory-grown freeze-dried cultures. It also explores how GMO technology is creeping into our cheese and the steps we can take to stop it. Image: Jasper Hill Farm's Winnimere raw milk cheese is aged 60 days. Its rind, washed in local beer and bound with a strip of spruce bark, encloses an unctuous, satin interior that harbours scents of fruit and smoke and has mellow richness with tangy undertones of earth. Image via The Cheese Shop. Now Tasmanian raw milk cheese producers Bruny Island Cheese Co. are running a crowd fund campaign to raise support for an exclusive raw milk cheesery. They have purchased a farm in the Huon Valley to be a small organic farm using old breeds that are no longer considered viable but were once prized for their quality milk. It will put animal welfare ahead of profitability and sustainability ahead of efficiency. Once the dairy is up and running they want to start building a new cheesery that will be dedicated to ONLY MAKING RAW MILK CHEESES, making it the only one in Australia.